Chevron made money in the third quarter, finally, but dividend investors aren’t out of the woods just yet. 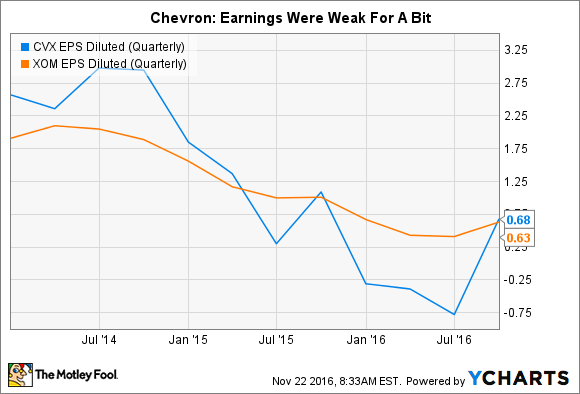 Chevron (NYSE:CVX) investors have been feeling the pain of the oil industry's downturn in the form of quarterly losses. The integrated oil giant bled red ink for three quarters in a row before getting a reprieve in the third quarter. But dividend investors shouldn't get too excited by a single quarter of positive earnings, because there's more that needs to be done. One look at the cash-flow statement will explain why. Chevron employees. Image source: Chevron. It's been pretty hard to love Chevron this year. The company posted a fourth-quarter loss in 2015. It followed that up with losses in the first and second quarters of 2016. Worse, the red ink spread wider with each earnings release. And this comes at a time when its leading U.S. competitor, ExxonMobil (NYSE:XOM), has continued to post profits, albeit modest ones. To be fair, some of the red ink was related to asset writedowns because of low oil prices. ExxonMobil avoided similar writedowns, which aided its bottom line. Exxon has been taking political and regulatory heat for that decision lately. But write-offs weren't the only problem, and the fact remains that Chevron shareholders had to have strong constitutions to hold on through three quarters of steadily increasing losses. CVX EPS Diluted (Quarterly) data source: YCharts. The reprieve came in the third quarter, when the company posted a profit of $0.68 a share. That was down from the year-ago period's earnings of $1.09 a share, but it wasn't red ink, and that's a move in the right direction. A big part of the quarterly profit was the lack of asset impairment charges, however the company has also been making progress on the cost side of things, too (more on that below). But there's more to the story than earnings, particularly if you're a dividend investor. One of the first things dividend investors look at is the payout ratio, which compares the dividend to a company's earnings. Chevron's quarterly dividend is $1.08 a share. Since earnings were just $0.68 a share, the company didn't cover the payout with earnings, even though it increased the disbursement by a penny a share in the quarter. That isn't always a problem, because dividends aren't paid out of earnings -- they're paid out of cash flow. The concern for investors is that the news on the cash-flow front isn't much better than the news on the earnings front right now. For example, Chevron's cash flow from operations was roughly $9 billion through the first nine months of 2016. Its dividends ate up $6 billion, leaving around $3 billion for everything else, most notably investing in future production. And that brings us to the first big warning sign. Chevron spent $14 billion on capital expenditures through the first nine months of 2016, way more than the cashflow it is generating. The problem that Chevron faces is that there's a finite amount of oil in its reserve base. Every barrel it pulls out of the ground has to be replaced or the company risks eventually running out of oil to drill for. In other words, it just can't stop exploring and developing new sources of oil and gas, it's a key part of the business model. So how is it pulling this off? The answer: debt. Through the first nine months of the year, Chevron has issued nearly $7 billion worth of debt while retiring only $800 million worth. That means it added around $6 billion in debt -- a number that just so happens to match really closely to its dividend outlays. In fact, through the first three quarters, Chevron's cash balance fell by around $3.5 billion. That makes complete sense given the numbers we've examined, but it spells potential trouble for dividend investors if the oil major doesn't find a way to turn things around. To be fair, like all of the oil majors, Chevron has been working hard to trim costs so it's better positioned to handle the current low-oil-price environment. For example, it's planning is based on oil prices of $50 a barrel to raise the bar when it does spend money on new projects. It's also working on improving efficiency, using best practices to increase returns in places like the Permian Basin and focusing on its highest return opportunities first. It's also reduced capital spending in each of the last two years to save cash. It expects to do so again this year and hopes for even more savings in 2017 and 2018. As noted above, though, it can only cut so deep here before it starts to hurt its long-term future. Chevron also remains financially strong, with long-term debt at around 20% or so of the capital structure, giving it ample flexibility to weather a downturn that doesn't last too long. That said, if you're a dividend investor, you should start paying close attention to the cash-flow statement. Despite the improvement on the earnings statement, there are still warnings signs flashing on the cash-flow side of things. Chevron is handling the challenge today, but if the downturn goes on too long it could have an increasingly difficult time paying for its dividend and its future.